Turnkey cost: R231 000 ex vat /SET, it include following. Turnkey cost: R297000 ex vat /SET, it include following. .. One 20’ container can load one JND-880 and 211,100pcs 500ml bottle pre-form 15g …. system, it controls various technical parameter needed more accurately and more steadily. Only one person without special training operates it more easily and more safely. JND-880 is fit to blow carbonated beverage bottles, mineral water bottles, cosmetics bottles and hot-filling bottles, especially oil bottles with handles. of compressing air from atmosphere to the required pressure. 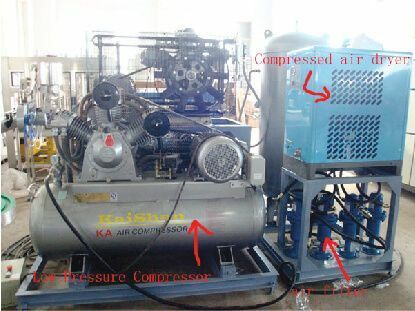 (2)…..Air dryer is to remove the moisture from the compressed air and lower temperature of the compressed air in the heat exchanger. (3)…..Air filter is to clear up the impurities out of the compressed air, like carbon-hydrogen, tiny dust and solid particles. 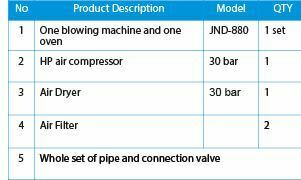 JND-880 is composed of blow molding machine and a dryer tunnel. 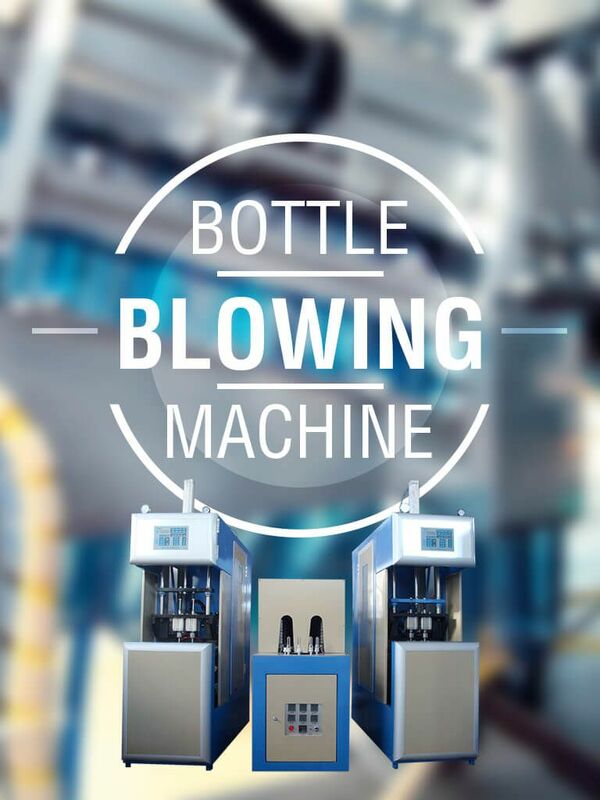 Simple operation and high control precision bottle blow unit is equipped with specially designed PLC control system. 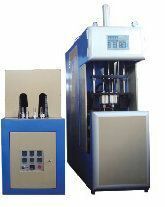 It controls the whole bottle production process through a soft touch pad with time control precision up to 0.01 second. Pneumatic unit provides power for machine movements including machine driving and bottle blowing. JND-880 is equipped with world famous brand components (Festo or SMC) to reduce the noise, save energy and produce the high quality bottles. 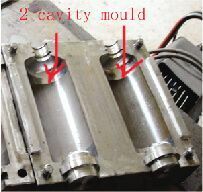 cylinder required in different mold installation. 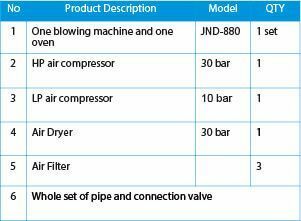 JND-880 has a plenty of assistant unit to increase the machine’s performance, such as air storage unit to keep the air pressure stable, grease-lubricating unit to reduce mechanical parts’ wear and tear, and multi-utilization air entry unit to meet air compressed air high-pressure single entry mode and high-pressure & low-pressure double entry mode. In order to keep both machine and operator safe, JND-880 installs twin startup switches on two sides of the machine, which should be pressed at the same time to start the machine. Preform heater adopts infrared lamp as heating unit. Infrared has powerful thermal-radiation capacity, which can heat up preform to required temperature in a very short time, while the strong thermal-penetrability provides continuous and uniform heating inside of preform and on surface of the preform. Preform heater adopts independent temperature control unit for each heating zone to offer ideal temperature for various preform. Each heating lamp has a voltage regulator to control the voltage of the heating lamps and keep it working smoothly. With the LED display, it becomes easy and convenient to inspect and adjust the voltage value. Preform heater is equipped with air-cooling and water-cooling device to remove the remained heat on preform loader and prevent preform neck from deformation. And reliable air exhaust system placed on the heater keeps heating temperature continuous and stable during preform heating process. 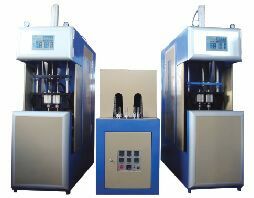 Multi adjusting device placed on the preform heater keeps the machine fitting with different prefroms. 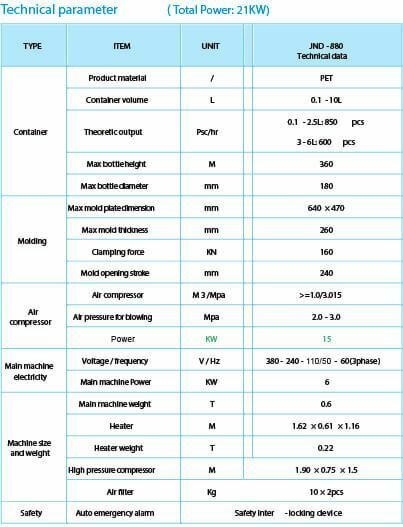 With those devices, the heating channel’s width and height can be changed easily according to the different neck size and neck height. Place formed preform onto preform holder of reheating unit. The preform holder carries the preform into oval heating channels where preform will be heated under set temperature. After a heat treatment through the heating channel, rotary prefrom holder will carry the heated preform out of heating channel. 60 days after receiving the full payment. Offering good service for the equipment’s after quality guarantee time. Train buyer’s technician in seller’s factory free of charge. The buyer travel charge at buyer own account. 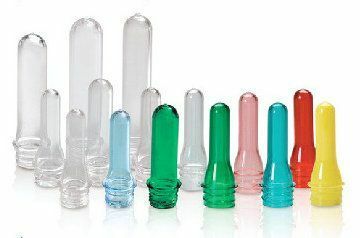 or send seller’s technicians to buyer’s factory to install the machine and do the training t buyer’s technicians. Seller technician travel charge, food, and accommodation during the installation at buyer’s account. Also the buyer need to pay for each seller technician R2000 ex vat per day as salary. Before the seller’s engineer arrive at buyer’s factory, the buyer must make sure that all of equipment’s are put in the correct position in their factory, the power and water supply must be ready in the factory. Supply detailed and professional manual books and Video CD to operate, install and maintain the equipment’s. All the above technical information and quotation is subjective to the final contracts made by both parts.